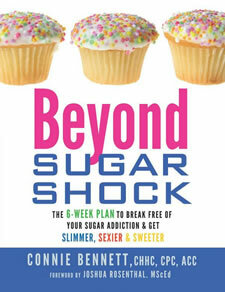 The sugar addicts diet is found in Beyond Sugar Shock, written by motivational speaker, journalist, blogger, former sugar addict, and author Connie Bennett. It is a six-week plan designed to help you overcome your addiction to sugar and other carbohydrate foods. Bennett explains how your sweet tooth can damage your health and how sugar has been linked to a range of conditions. Excess sugar intake can play a role in development of heart disease, cancer, osteoporosis, diabetes, migraines, depression and kidney disease. It also speeds up the aging process and suppresses your immune system. At the beginning of the book there is a quiz to help you determine how addicted you are to sugar and carbs. You are then categorized as a green, yellow or red-lighter depending on your degree of “sugar shock”. Those with the most serious sugar addictions may need to quit immediately whereas others can reduce their consumption more gradually. For the first three weeks of this sugar addicts diet you will get ready to eliminate sugar and “quickie carbs” from your diet. Each week you are given four activities to undertake. You should focus on them for five days a week and have the weekends off to relax and reflect. They cover a wide scope including having a positive mindset, increasing your nutritional knowledge, discovering healthier sweet substitutions, exercise and meditation. After week three you will begin to implement your sugar-kicking plan as you continue to discover more tools to assist you in this process. Bennett clearly outlines the pros and cons of all three approaches so that you can make the decision that is right for you. Bennett recommends obtaining a balance of protein, healthy fats and low-glycemic carbohydrates in every meal. She describes this way of eating as a cross between the Mediterranean and Paleo Diets. You are also encouraged to eat vegetables at every meal and to emphasize organic foods. If you crave something sweet, fruit is a good choice but you should have protein and/or fat at the same time. For example you could try strawberries with goat cheese or a dark chocolate-covered banana. Also included is advice on nutritional supplements that can reduce sugar cravings and a seven-day meal plan with recipes. Grass-fed beef, free-range chicken, salmon, sardines, shrimp, eggs, goat cheese, walnuts, oats, almonds, flax seeds, chia seeds, lentils, hummus, quinoa, brown rice, oatmeal, whole-grain bread, broccoli, asparagus, spinach, kale, sweet potato, sea vegetables, avocado, berries, pear, grapes, coconut oil, olive oil, herbs and spices, dark chocolate, goji berries, bee pollen, herbal tea. High-intensity interval training is recommended because it is the most effective and time efficient way to burn fat. This involves short bursts of intense activity. Additionally this type of exercise raises your levels of the “feel-good” hormones, serotonin and dopamine, which helps reduce cravings for sweets. If you haven’t been working out regularly you can get active by doing gentle walking or yoga for 15-30 minutes at least three times a week. Then when you are ready you can start to incorporate high-intensity exercise into your routine. Beyond Sugar Shock: The 6-Week Plan to Break Free of Your Sugar Addiction & Get Slimmer, Sexier & Sweeter retails at $15.95. Program specifically designed to help you overcome sugar addiction. Addresses the importance of psychological factors involved in making a successful lifestyle change. Encourages the intake of fresh, unprocessed, organic foods. Includes a seven-day meal plan with recipes. Emphasizes the importance of adequate sleep. Dieters may have to give up or strictly limit some of their favorite foods. Quitting sugar cold turkey can produce unpleasant withdrawal symptoms such as headaches, fatigue, and irritability. Not relevant to dieters who are not addicted to sweet foods. Beyond Sugar Shock is a step-by-step, six-week sugar addicts diet for overcoming addictions to sugar and refined carbohydrates. As you regain control of your eating behaviors and start following a healthy lifestyle you will naturally move towards your ideal weight.